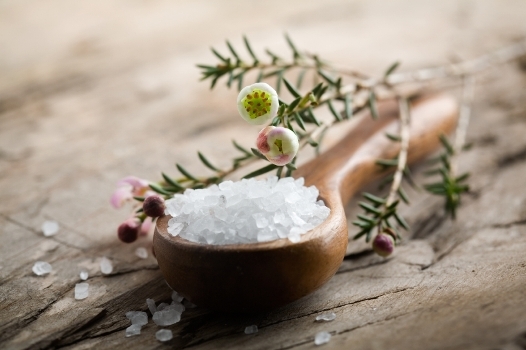 It may surprise you to know that Epsom salt is not really a salt at all. It is a mineral compound that consists of magnesium sulfate that is found in a saline spring located in the town of Epsom in Surrey, England. It has been recognized for its health benefits, but it is also useful in the areas of household, beauty, and gardening. Relax. Put two cups of Epsom salt into your bath tub and enjoy a 15-minute soak. You will be so relaxed when you get out that you may need to hold on to the tub at first. Splinter removal. Next time you get a splinter on the fingers, reach for the Epsom salt and soak your finger before you remove it with the tweezers. Sunburn relief. If you find that you have been exposed to a little too much sunshine, you can ease the pain with a soak in a warm bath that has 2 cups of Epsom salt added. Smooth mosquito bites. Combine 2 tablespoons of Epsom salt for every cup of water and soak a washcloth in the mixture, then apply it to the bite area to ease the discomfort. Relieve sore muscles and arthritis. Soaking in an Epsom salt bath can relieve everything from a headache to arthritis and sore muscles. Add 2 cups of Epsom salt to your bath and soak for about 15 minutes. Ease constipation. Add 1/4 tsp. to 1 tsp. of Epsom salt to a cup of water with honey and dink the mixture. It can be an immediate relief for constipation. Feet. For soft and silky feet, soak them in 1/2 cup of Epsom salt and warm water for about 5 minutes every few days. Hair. It can improve the volume of your hair when you put equal amounts of Epsom salt with conditioner. Apply the mixture to your hair and let it stay on for around 20 minutes. Face. Mix 1/2 teaspoon of Epsom salt with your facial cleanser and scrub it into your face to deep clean your pores. Hair waves. If you want to keep waves in your hair, add 2 tablespoons of Epsom salt in 1 cup of hot water along with 1/2 teaspoon of conditioner and 1 teaspoon of aloe vera gel. Put the water mixture in a spray bottle, spray it on your hair. Body rub. Exfoliate your body using 2 cups of Epsom salt, 1/4 cup petroleum jelly and some lavender essential oil. Help flourish the plants. Your plants will grow well if you add Epsom salt to them. The sulfur and magnesium in Epsom salt help them flourish. Clean the tiles. You can clean your tile effectively and economically using the same amount of Epsom salt added to dish soap. Scrub your tile and rinse well with water. Prevent slugs and raccoons. You can keep slugs out of your garden by sprinkling Epsom salt everywhere you do not want to find slugs. And if you have a problem with raccoons hanging around your trash cans, just sprinkle some Epsom salt around them—they also do not like the smell.